Over the knee boots mmm... 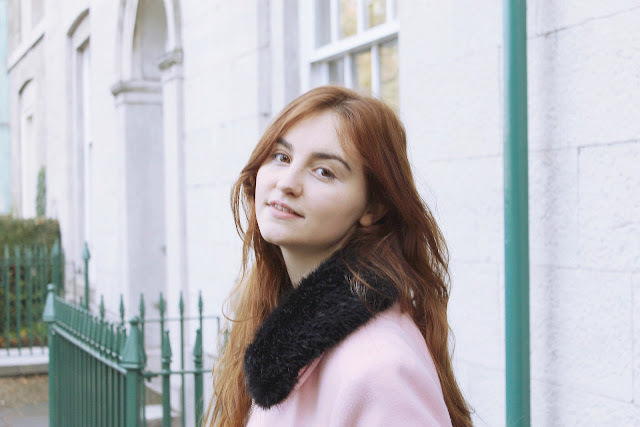 I don't often feature pictures of myself on my blog and doing this feels kind of scandalous. I can no longer control everything from behind the lens and instead have to find something to do with my arms while the camera picks up every detail, messy curl and blemish. Here is one of my favourite looks at the moment, I love the cute ice cream hues and layers, it reflects my crazy pastel lady personality. Those thigh high boots... right after taking photos I realised I didn't have many shots of these babies on their own, I didn't capture them as well as I should have but they are seriously beautiful! I have Rheanne entirely to thank for buying these. I remember searching for them after seeing them looking beautiful on Freddy My Love but couldn't afford them at the time. Rheanne found them for me at a discounted price and I've never been so grateful to own a pair of shoes! They stay up so nicely and tucking the tops inside my socks helps too. My coat is the colour of pink milk. I wrote about it here nearly a year ago and I have been so excited all year round to get it out again, I adore the fit and feel, it's so fleecy and soft, silky on the inside. 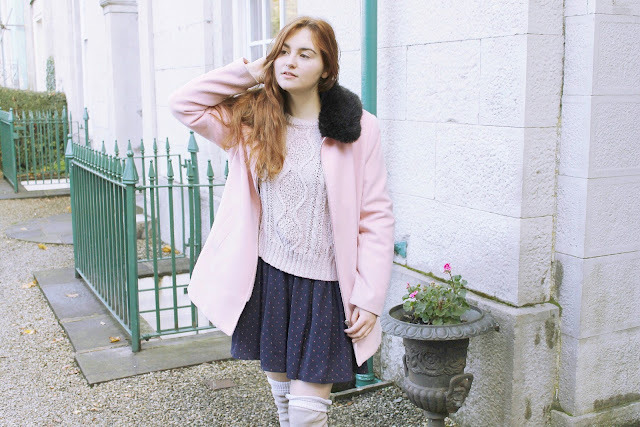 I love how it adds a pop of pink to any outfit and it makes me feel all cosy and wintry. I paired it with my Forever21 jumper. The faux fur collar is so snuggly too, I feel like a liquorice allsort wearing it. Every time I try to style my hair in winter, it will not hold, the cold wind is quick to whip it up in to bed head curls whenever I step outside. I recently discovered the freedom of a skort and I have no idea why I never invested before. I used a 50% off Boohoo discount to get two for £10 and they are both adorned with little crescent moon shapes. They are loose, floaty, comfy and so cute and are an amazing alternative to a mini skirt, when your life involves bending down, chasing and scooping up a two year old. They've helped me break free from wearing tights every day! Wow, amazing outfit, so nice and interesting combination, like it so much! Wonderful coat, boots look amazing! You look gorgeous gal, I love those boots! Such an amazing and romantic look. The knee-high boots are super pretty, I'm looking for a pair too but it can be hard to find the right ones - and I feel like this pair is perfect for you! Love this! Such a gorgeous look.